There’s a long road ahead for SoCal sea star populations that are slowly recovering from the Sea Star Wasting Syndrome that hit the area in late 2013 – and SoCal residents are encouraged to help play a part in monitoring the process. Four years ago, SoCal coastlines and intertidal outcroppings were strangely devoid of sea stars, victims of the debilitating event which many experts hypothesize as a virus or bacteria. (Contrary to social media hype, scientists say that the syndrome was not the result of the Fukushima meltdown.) Developing lesions, millions of infected sea stars lost limbs and had their bodies turned into goo. Similar wasting events have been recorded in the past, but none of this magnitude; in which diseased sea stars were observed concurrently from British Columbia, Canada to Baja California, Mexico. Now, marine biologists are observing populations of ochre sea stars SoCal waters; some sea stars appear healthy but some, sadly, still show signs of the disease. Marine ecologist Stephen Whitaker has been monitoring 20 sites around the Channel Islands National Park as part of a long term monitoring project and submitting observations to MARINe, a multiagency consortium that has been collecting and sharing data on intertidal species from Alaska to San Diego. Whitaker recently visited 16 sites and reports that four sites have between 13-28 sea stars, while others have less than five or none at all. This is a dramatic decrease compared to before the disease in 2013 when abundances averaged several hundred individuals at most sites. It will take several years – maybe decades – for sea stars to grow and reach a healthy abundance; at one time recorded sea stars numbered in the hundreds and above 1,000 at sites within the national park. Some species were hit harder than others, explains Whitaker. Stars in colder deep waters often escaped diseases that wiped out their fellow stars in shallower waters. But this recent event even reached those deep dwelling stars. “That’s one reason that temperatures may not play a factor in this wasting event,” he explains. 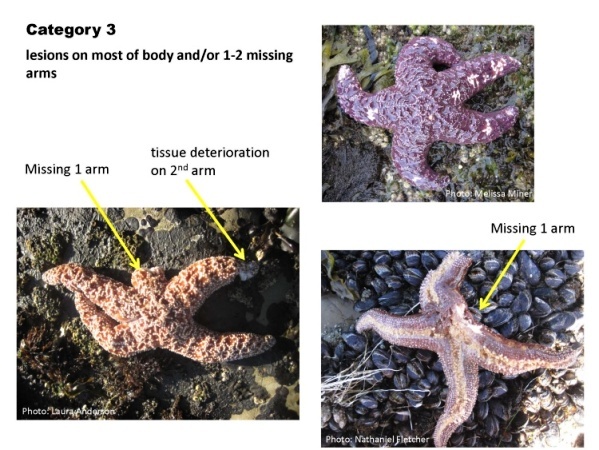 Interested folks can check out identification and symptom guides to specific sea star species — including juvenile ones — and learn how to submit observations at MARINe’s website. 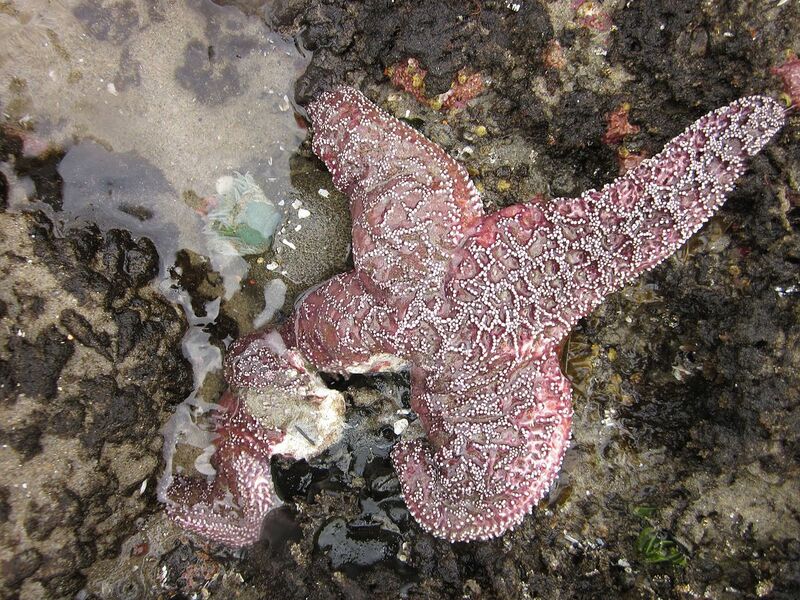 You’ll be asked to record specific site information, sea star species seen/not seen and other important information like the location type (sandy beach, intertidal, etc.) and depth; sending photographic images is a big plus. PUBLIC HELP: Find a sea star? Let others know through the MARINe website where you will learn how to identify sea star species, levels of symptoms and more. 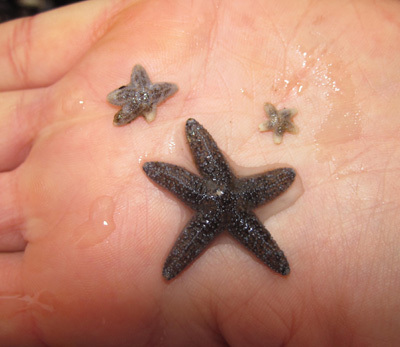 Indeed, Miner says that researchers are discovering that north of Point Conception, large numbers of juvenile stars have been observed at some sites, a good sign that some sea star species are spawning and “recruiting” new individuals. But south of the Point…not so much. Still, the typical spawning season is in spring and fingers are crossed for babies. Researchers are also witnessing new sea star behaviors, especially involving how fast sea stars are maturing, says Miner. A quarter-sized star used to mean a 2-year-old. Now, that same size may mean a 1-year old individual. Miner says multiple factors are probably at play, like food availability, habitat, etc. But one theory suggests these stars are spawning and maturing as a “stressed-out last ditch effort to reproduce” in light of such low numbers. Researchers are also learning more about basic sea star biology from the event, says Miner. “By tracking pulses of recruits over time, we can learn more about growth rates, and how they might vary among sites,” she says. 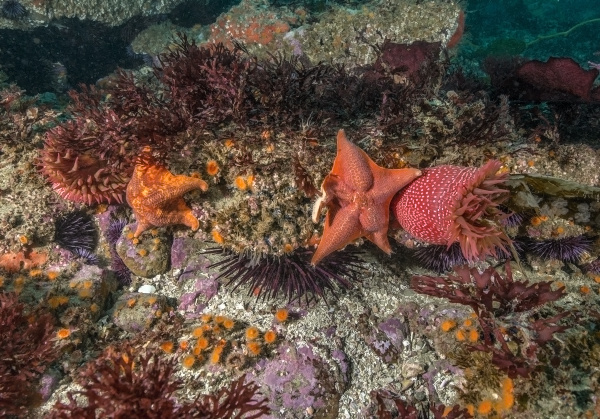 Researchers are also learning how a decline in sea stars can lead to changes in the ecosystem; with no sea stars predators, urchin populations are mushrooming in some regions, which affects numerous other species. “The marine ecosystem is tremendously complex and we understand so little of it,” sums up Whitaker.